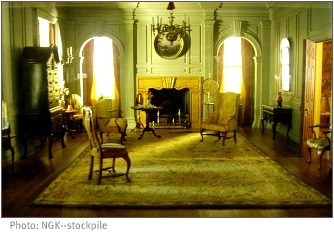 Victorian decor harks back to a time of wealth and family. If you love lots of beautiful pieces of antique furniture then this vintage style allows you to show it all off in all their glory. This period allowed the lady of the house to show off her home-making skills with home-made lace and embroidery. This was truly a case of “more is better”. I think this look can work well if your furniture pieces are co-ordinated, otherwise it may come across as cluttered with no continuity. This style of decorating is also very ornate, everything you had was displayed for everyone to admire. If you have collections of ornaments, plates or anything else, this decorating style allows you to show off your collections with pride. With this opulent style you can really be bold and brave with colour and accessories. Think of a peacock with its bright and beautiful plumage - it is showy and impressive, just like the Victorian style of decorating. 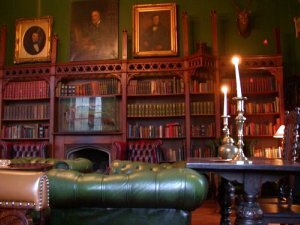 I thought I would set myself a little challenge to show you the steps I would take to transform a standard living room into a Victorian styled one. 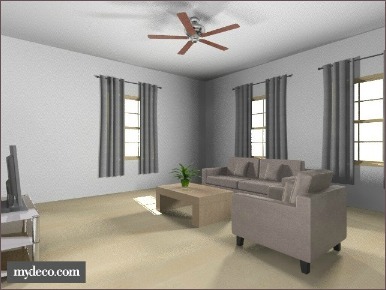 Seen below is my rendering of a standard living room. As you can see, this room is fairly modern. Well I did what I could and here is the end result featuring Victorian decor. I'm sure you can imagine that there was a fair amount to alter. The first thing I did was to add a picture rail to the walls - just to posh things up a bit. In order to create a Victorian style I could live with I decided to forgo the ornate wallpaper and chose a pale blue paint instead. The existing curtains were shed in favour of luxury ceiling to floor curtains that create a dramatic effect. Unfortunately the armchair had to go, and was replaced by two fancy chairs. The modern wooden coffee table was also a no-no, and a Victorian inspired marble topped table was used instead. 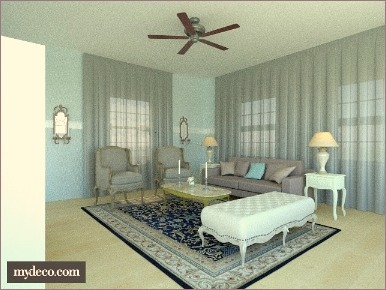 Because Victorian decor is very "full", I added a long ottoman to the mix as well. I accessorised with a flamboyant area rug as well as co-ordinated side tables and lamps - symmetry helps to pull this style together. Further symmetry is created by the mirrored wall sconces that are repeated throughout the room. As a final Victorian tribute, the TV stand was replaced by a large white wall unit.